Friday was another good day. A new project. This time video. 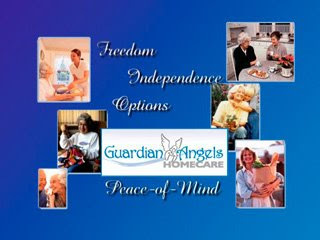 VIP Studios provided video taping for a home care company called Guardian Angels Home Care in regard to new employees. The business owner called me a few months ago and asked if VIP Studios could help her produce a video for employee orientation. I said yes, and when she was ready, we could start the project rolling. She called back and we set a date and time for March 28th. I showed up on time and shooting started at 12:30 PM. There were three parts to cover. Part one was Pat introducing herself and welcoming the new hire to the family of caregivers, part two was Kim giving the orientation, the process of doing the correct procedures expected by the the new hire, plus Q & A or frequently asked questions. Part three was Jessica doing a segment on Living with Dementia. The shoot lasted about two and one half hours, everything went well and I was very pleased with how prepared the company was. Definitely a good company to be involved with either for home care or for employment. I really like the way the company respects and treats you. They would be happily devoted as your Guardian Angel and it shows. Now comes the editing portion of the project. I will make sure this video exceeds their expectations. It would be well worth the effort. 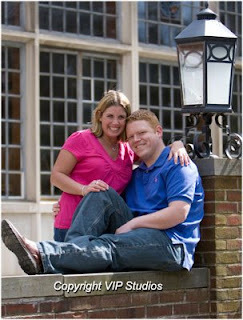 Saturday, March 22, 2008 - Meet Kara and Brian at 1:00 PM for pictures. 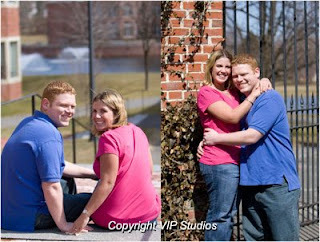 VIP Studios had a great day photographing Kara and Brian in preparation for their wedding engagement announcement. The wedding will take place in Middlebury on August 8, 2008. The three of us met up at around 1PM on this Saturday past and spent an hour together getting some great pictures and had a wonderful time! I was very pleased with meeting Brian for the first time. He was very easy to work with. Kara is a past client of mine so I kind of knew her from before and I was very comfortable knowing we knew each other which makes everything work so well. We actually took approximately 200 pictures. These are just a few of them that caught my eye for the blog. I still need to finish up going through the rest of them, so hopefully I can get these done soon! See ya! Aren't they a great couple!!!! Well, I didn't hit the lotto last night and it's been raining all morning, so I guess I will have to put some hours in at VIP Studios. It's a good thing I have a photo shoot this afternoon with a client that needs to document a scar for a legal case pending. This will keep me motivated to say the least because I love working with photographic images and since I can't shoot outside, the studio will be a perfect place for me today. 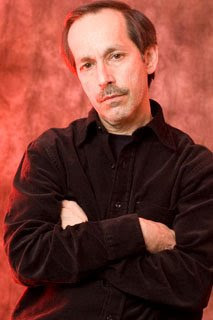 Just a quick mention to thank Greg for reading my blog. Thanks Greg!! The PVA video meeting was at a new place (The Holiday Inn in Waterbury near Costco) last night and I think by the way things went, I will not have to travel far for the meetings for a while. Thanks Marleen! Great Job! I love Saturdays!! Here's to you!!! I am going to put my best foot forward and tackle today with a positive attitude and get a lot accomplished. My day just started at the office so off I go! Let's rock at VIP Studios! Yes......, I did get a little emotional on this job. 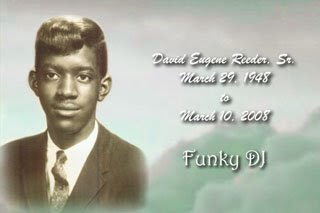 A good friend of mine Ken Reeder, a Disc Jockey I have known for over 20 years called VIP Studios and asked if I would be able to video tape his brothers "HomeGoing" Service this week at Grace Baptist Church. I committed and said yes, having done a funeral service before, it wasn't my first, but this one was different. Seeing his brother David Reeder in a open casket and having his mom, brothers, sisters, and extended families all there filling the church pews really got the best of me when the hymns were being sung by the choir, hearing the pains of sorrow from the closest family members and the eulogies they prepared and spoke so softly, broke me down to a humble person. I could not help my eyes from welling up as Amazing Grace rang through those church walls. David must have been a very special person. It showed throughout the service the family so carefully put together. As the pastor spoke, he reminded us that we can make and brake all the appointments we want, but one. God's appointment with us is one that we have no control over, it's in God's hands and when that scheduled appointment is set.....it's time. I was honored to have the privilege to video tape for Ken Reeder. I have always respected Ken. After today, my thoughts of gratitude, family, and love are more thought about in a more deeper sense. As the saying goes......Here today, gone tomorrow. I want everyday to count now. This is a new day. Thank you Ken Reeder for the opportunity to meet your wonderful family. Welcome home David, welcome home. A new day, a new start, a new journey into Blogging! Today is the first day of a hopefully new successful venture. VIP Studios just started its' first blog and here it is! Looking forward to hearing comments from anyone and get me headed in the right direction. Please meet Ebonee. A very attractive young lady form New York, who called to have her portraits taken at VIP Studios. We had a great time. We took a lot of photographs a few weeks ago and she was very pleased with the vast selection to choose from. What a great gal! This has turned out to be a very interesting and challenging year for me so far. I am getting immersed in my photography work, trying to juggle between still photography and video photography work has really kept me going in all directions. I am booking portrait sessions more frequently now at the studio and enjoy the time I spend with my clients. We have a good time together getting creative while the music is playing, sometimes even blasting! Always open to my clients new ideas either in studio or on location. My motto is: at VIP Studios, lets have some fun and get CRAZY!! Pictures are a blast! Smile baby!